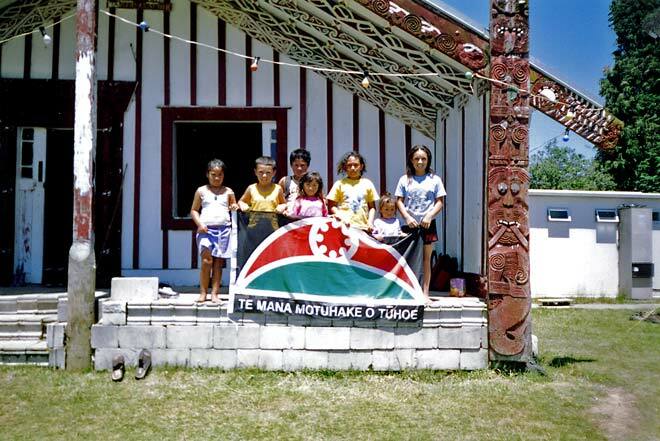 These young members of the Tūhoe tribe are shown in front of the Tāne-nui-a-Rangi meeting house at Maungapōhatu, in the heart of the Urewera forest, on New Year's Day 2004. At these holiday times, many Māori who have moved away from their tūrangawaewae – traditional tribal territories, literally 'a place to stand' – return there, to renew relationships with their kin who keep the fires burning. These may also be occasions for passing on tribal traditions.